A few months ago I made some preserved lemons , knowing that I would make a tagine one day – some things have to be planned ahead! 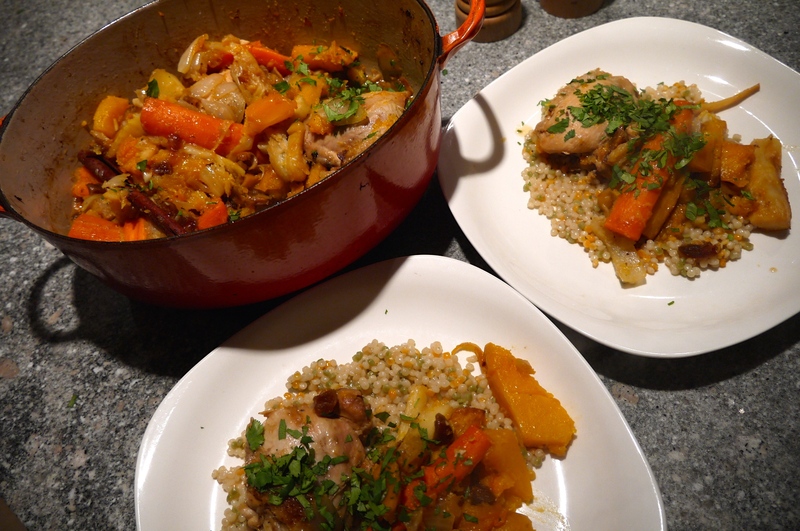 So I had the beautiful sunny gems waiting in my fridge to use in this chicken and vegetable tagine, and they sure did make this recipe shine. The recipe I ended up with was is amalgamation of two recipes I found online, here and here, and then a bit of my own experimentation. I really wanted it to be full of a variety of vegetables, and tons of flavour. You could omit the chicken to make this a lovely vegetarian dish. I would probably throw some toasted nuts on top to add some protein. I served the tagine on Israeli couscous, which have a nice pasta-like bite to them, but you could also serve it on regular couscous or rice. A tagine is a crockery vessel with a conical lid. I do not own a tagine, nor do I have room in my tiny kitchen to store one, so I have used a le Creuset lidded pot in its place. I’m sure so much of this recipe is inauthentic (yet awesome! ), so using the wrong vessel is probably fine. Use any large lidded dish you have that can be used on both the stove-top and in the oven. Place the onion wedges, butternut squash, carrots, parsnips and red pepper on a baking tray. Drizzle with olive oil and place in the oven to roast. This will take anywhere from 20-40 minutes. It’s okay if not all the vegetables are cooked through, but they should get some colour. Heat 1 tablespoon of olive oil in a large skillet or a dutch oven with a lid, on medium high heat, then add the chicken. Brown the chicken on both sides, then remove it from the pan. The chicken does not need to be cooked all the way through, as you will continue the cooking process later. Lower the heat to medium-low and add the shallot and ginger to the pan. Cook until the shallot has browned. Add the fresh ginger, cumin, coriander seeds, cinnamon, saffron, chili, and ground ginger to the pan and cook until fragrant. Cut the peel off the preserved lemon and discard all the inside bits. Chop the lemon peel into about 1cm pieces. Add the chicken stock, honey, apricots, and preserved lemon to the pan, and then add the chicken back to the pan so it is mostly submerged in the broth. Simmer the chicken until the vegetables are ready. Add the roasted vegetables to the pot with the chicken. Gently combine them so they don’t break up. Put a lid on the skillet or dutch oven and place in the oven for 20-30 minutes, until the flavours have had a chance to mingle, and the chicken and vegetables have cooked all the way through. Serve on couscous or rice, garnished with cilantro.